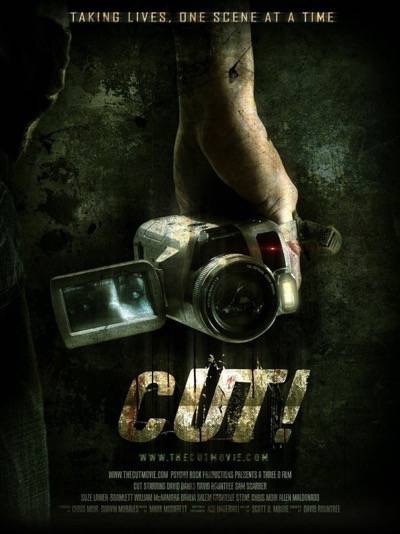 Film Review: CUT! | "DESTROY ALL FANBOYS!" Just when you think the modern Hollywood horror film has been all tapped out, along comes one of those movies that keeps you guessing even if you think you know what’s coming. Director/co-writer David Rountree tosses some tasty ideas into his chunky horror stew that will keep you hooked in and guessing right up until the double (or is it triple?) back-flip ending. It’s tricky to discuss the film in detail without spoiling a few of its twists and turns, but if you’re paying attention you may see a few of the surprises coming. That said, if you go in with expectations of yet another slasher film, it’s a good sign that the movie shoots you down a few predictable paths before whipping the red carpet from underneath you much more than you’d think. Rountree also stars in the film as Travis Simon, an employee of a film equipment rental shop who works with Lane (David Banks), an ex-con with a rather nasty disposition and a particularly unsettling hobby. When Travis decides to make a low-budget horror film with Lane’s help, let’s just say things go predictably awry and downhill fast. A little accidental death during the making of their film doesn’t deter the pair from continuing their project and in fact, spurs Lane on as he starts taking things a bit too seriously. CUT! zips between black comedy and dramatic bits with equal relish, piling on just enough shocks and blood spilled without going too far into the red zone. It also works as a thriller because it drops you into a mystery as you slowly see that not everything is as it seems on the surface. That said, Brooks plays Lane as such a wholly unlikable guy right from his first scene that you’ll wonder how the hell super-nice Travis is even acquainted with him. Of course, this plays heavily into the plot, but saying more enters into spoiler territory. While it may seem like a flaw, the Travis/Lane dynamic is actually one of the things that makes an oddball kind of sense by the climax. The movie toys with the audience like a cat batting around a mouse or bird before going in for the kill and depositing a little gift on its owner’s lap. Somehow, the two continue filming, the bodies start piling up and yes, your brain will go on a neat little spin as the film progresses. In addition to some solid camerawork and pacing throughout, Rountree’s gets some nice work from his small cast that includes Sam Scarber, Dahlia Salem. Watch out for the cameos from Suze Lanier-Bramlett (The Hills Have Eyes, The Hills Have Eyes Part II) and Gabrielle Stone, both of whom get some icky verbal abuse from Lane when they pop up to pick up some rental equipment for the film they’re making. It’s an interesting scene for the amusing, obvious name-dropping as well as another chance to show what a total creep Lane is to anyone he encounters. This entry was posted in 2015, DAF, Features, Humor, Movie Posters, Updates and tagged CUT!, Dog House Post, Film Reviews, Friday the 13th, Horror, Horror Films, Horror Movies, Indie Films, Mature, Movie Posters, Movie Trailers, Movies, Not For The Kiddies!, Psycho Rock Productions, Scary Stuff, See It! by geelw. Bookmark the permalink. Thank you so much for taking the time to watch and review CUT! Your feedback means a lot to our production and we thank you for sharing your opinion. And a fun tidbit, Re-CUT! is in the works. Oh, thanks for making such a cool film, sir! It’s definitely a “cut” above a good deal of what’s out there.